Tim Thomas was spectacular again, as he helped the Bruins secure a Game 6 victory on Monday! Brace yourself, the Boston Bruins, yes; the team that all New Englanders consider second fiddle to the Red Sox, Celtics and Patriots are headed to Vancouver for Game 7 of the NHL Stanley Cup Finals. Doesn’t that seem odd or unusual? It does, especially since the Black and Gold haven’t encountered a game of this magnitude in their franchise history. Although, if there’s ever a time to end their 39-year-old drought, it’s now, especially against the New York Yankees on ice. On Monday, Boston took care of business, as they recorded four goals in a span of four minutes in the first period. Cory Schneider replaced the talkative Roberto Luongo and finished the game with two goals allowed and 30-saves. However, his effort wasn’t enough to keep Vancouver in position to win their first Stanley Cup, as the Canucks registered just two goals by Henrik Sedin and Maxim Lapierre. Brad Marchand, Milan Lucic, Andrew Ference, Michael Ryder and David Krejci all recorded goals for the Bruins, while Tim Thomas recorded 36-of-38 shots between the pipes. Game 7 is Wednesday in British Columbia and yes; it’s for all the marbles. The Canucks are 3-0 at home this series and certainly, they’d like to make it a perfect, 4-for-4. The Canucks are one game away from winning the NHL Stanley Cup Finals, but really, do they deserve the crown? There’s a part of me that, at the beginning of the Stanley Cup Final, didn’t mind losing to Vancouver. That whole feeling evaporated since Game 5. When the Bruins lost Game 1, I didn’t know a whole lot about the Alexandre Burrows biting incident. I didn’t really know about all their unnecessary physical play and I felt the emotion was riding high, but it was right where it needed to be. But then, after Game 1 and going into Game 2, something totally changed, taking my positive attitude towards the Canucks, their organization, their fans, and the entire nation of Canada with it. I realized the Vancouver Canucks do not deserve to hoist the most storied trophy in sports. They do not, and if the game expects to maintain its integrity, the Gallery Gods need to shine down and deliver the Cup to Boston, a place where it can have restored integrity and respect. Maxim Lapierre is the reason why the Vancouver Canucks lead the Boston Bruins, 3-2 in the NHL Stanley Cup Finals! If the Boston Bruins want to win their first Stanley Cup in 39 years, there’s only one way they can do it: they must win Game 6 at home on Monday night, then travel back to Vancouver and win a decisive Game 7 next Wednesday. On Friday night in Game 5, Boston suffered its third one-goal loss of the series, a 1-0 shutout against the Canucks at Rogers Arena. Vancouver now leads the series, 3-2. There was plenty of hard hitting throughout, especially from Vancouver. The goaltending was spectacular on both ends. Tim Thomas was his usual amazing self, while Roberto Luongo showed no effects of giving up 12 goals in the last two games. The game was a scoreless tie until early in the third period. After Kevin Bieksa’s shot went wide and off the boards, Maxim Lapierre was in the right place to slip one past Thomas for the only goal of the game. The goal spoiled another brilliant effort in net by Thomas, who stopped the 24 other shots he faced. But he was one-upped by Luongo. The Canucks’ goalie, who was yanked in Game 4, made 31 saves to earn his second shutout of the series. Game 6 is Monday night at TD Garden. Again, the Bruins must win; otherwise the Canucks will be skating around the Boston ice with the Stanley Cup. The home team has won every game in the series so far. Bruins’ fans hope that trend continues for just one more game. Torres's only goal proved to be the difference in Game 1 of the Stanley Cup Finals. In Game 1 of the Stanley Cup Finals Wednesday night, the goaltending was spectacular. The penalties were many. The hits were punishing. The goals were few and far between. 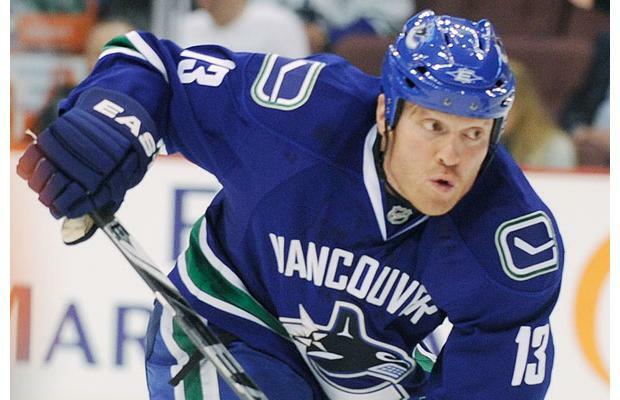 It was a scoreless tie until Raffi Torres took a feed from Jannik Hansen, and beat Tim Thomas with 18.5 seconds remaining in regulation to give the Canucks a 1-0 victory over the Bruins, and a 1-0 lead in the series. Thomas and Robert Luongo were incredible between the pipes all night. The two teams combined for 70 shots. The first 69 were stopped, while the 70th was not. Thomas’ best saves came in the third period, when he stoned Hansen on a breakaway. Then a few minutes later, he robbed Maxim Lapierre on a 2-on-1. Shortly thereafter, he caught a huge break when Alexander Edler’s shot hit the crossbar. But he had practically no chance on Torres’ game-winner. One play that will be talked about in the days to come happened at the end of the first period. Vancouver’s Alex Burrows was penalized for roughing. Replays showed he appeared to bite (yes, bite) the finger of Patrice Bergeron. That penalty was one of 13 called in the game. But the teams combined to go 0-for-12 on the power play. Each team was unsuccessful with a two-man advantage. Game 2 is Saturday night in Vancouver.